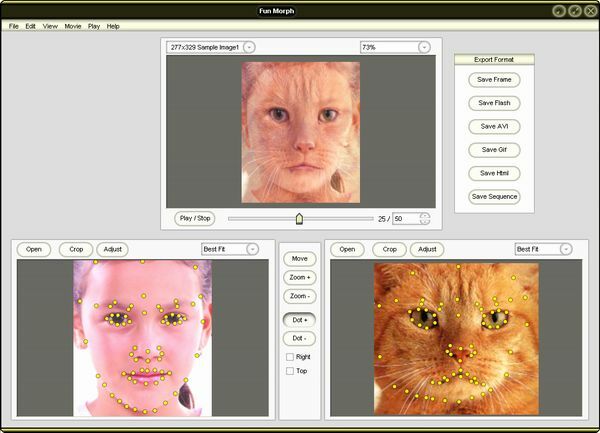 Funny Morph Maker is funny and easy to use photo morphing and warping software. Morph and warp face or image of friends, family, celebrities. Turn them into a cat or a pig or any jokes! Funny Morph Maker is funny and easy to use photo morphing and warping software. Morph and warp face or image of friends, family, celebrities. Turn them into a cat or a pig or any jokes! You can save movie in all popular formats, including avi video, web page, email, greeting cards, animated gif, picture sequence and etc. Let your imagination run wild, share your morph movie with all your friends and family, they are absolutely incredible! Morph and warp face or image of friends, family, celebrities. Turn them into a cat or a pig or any jokes! You can save movie in all popular formats, including avi video, web page, email, greeting cards, animated gif, picture sequence and etc. Ulead COOL 3D - Create animated 3D titles and graphics for output as still images, GIF animation, video or 3D Flash movies. WatermarkPhotos - Create images, text or graphical objects as watermarks on images or photos for copy protection. Multimedia Manager - Multimedia Manager is an all-in-one multimedia viewer, player and manager. Easy Screen Capture - Capture any part of your screen and make professional screenshot. Virtual Flower - Virtual Flower is a piece of useful software, which helps you create flowers, trees and other patterns in 3D.